Your family is very important when it comes to wedding planning, as well as the wedding itself. Many people choose their siblings to be bridesmaids or groomsmen, but for all those family members that aren’t included in that category- they still have a lot they can do to help the wedding go smoothly. Of course, your family will be dressed in coordinating colors- maybe not the same attire styles as your attendants, but they will still match. Your family will also be in most of your wedding photography- possibly even more pictures than your attendants will be in. One thing that your family will be doing that the attendants won’t is standing in the receiving line with you and your new husband. 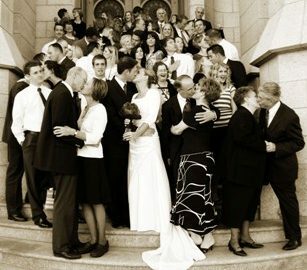 Do not over look your family when you are delegating all of the many tasks of the wedding. Remember that blood is thicker than water and your family will be able to take more demands from you than your friends will. One of the best things about families is that each family member will potentially be really good at one or two aspects of the wedding planning. Figure out who can do what and make sure they are willing and able to do it, and then you can have even less stress on your shoulders. As always- since your family will be helping you out tremendously with the wedding, make sure you are good to them. One of the best things to do is come up with a list of things that needs to be done for your wedding planning and then ask your family members what they would like to participate in. This makes them feel like you really want their help with the wedding and you want them to have fun doing it. You may also choose to give them gifts after the wedding reception is done. This is a great way to show your appreciation, but even just a card and a hug can do the trick.